There are 0-0 draws (like USA’s thrilling 2008 slug fest with Argentina). And then there are 0-0 draws (like tonight’s insipid tie). Manager Bob Bradley continued to show that he’s willing to try new faces and formations, but his tinkering failed to have an impact against Colombia. USA’s gaffer has apparently been reading FFG. 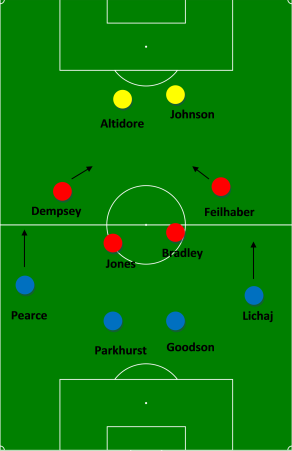 His 2nd new formation in as many games – a 4-1-4-1 – echoed a formation we recommended earlier in the week, as Bradley the Elder decided to feature three holding midfielders (Jermaine Jones, Maurice Edu, and Michael Bradley). Defensively, the formation worked. Edu commanded the space between the center backs and his fellow central midfielders, preventing Colombian danger man Falcao from having an impact. The formation did peter out going forward. In theory, the strategy was simple. If a possession started on the right, Bradley dropped deep to begin the attacking sequence and Jones inched forward, with Edu serving as an outlet in case of pressure. When the ball was recovered on the left, the opposite occurred: Jones became the deep-lying playmaker and Bradley scooted up the pitch. 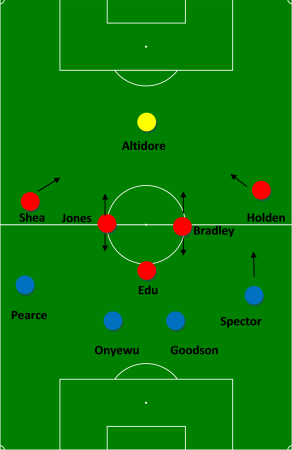 Additionally, wingers Stuart Holden and Brek Shea (who earned his first cap) drifted inside to provide a link between striker Jozy Altidore and the three-headed midfield. Each player stuck to his role, but nothing ever clicked. Jones and Bradley got in each others’ way. Holden and Shea always seemed too close to their midfield counterparts (allowing Colombia to easily bottle up passing lanes). Right back Jonathan Spector even tried to overlap with Holden, but outlet passes came his way too slowly. The end result was a series of possessions that poorly mimicked World Cup champion Spain’s short passing game. In other words, it was a really boring half bereft of shots. That’s not to say the formation should be completely discarded in the future. The addition of Clint Dempsey and Landon Donovan should bring class to the attack, and, with more practice time, Jones and Bradley could work out the kinks. A formation change (and five substitutes) brought more energy to the attack, but the outcome – toothless possession - was the same. With Clint Dempsey and Benny Feilhaber scampering inward in Bob Bradley’s preferred 4-4-2, fullbacks Heath Pearce and Eric Lichaj were more involved in the final third. Newcomer Lichaj even provided the best service of the evening, a perfectly weighted 86th minute cross that Altidore should have headed home (Pearce, in contrast, flubbed an opportunity a minute later). Still, shooting opportunities were sparse. The few occasions forwards Altidore and Eddie Johnson picked up the ball in dangerous positions, they made poor decisions or were easily dispossessed. Even Dempsey had difficulty influencing the match. The 4-4-2′s lack of success showed that the 4-1-4-1′s similar failings should not be assigned solely to the formation. Tinker, Tinker, Little Manager …. The match was boring. The play was uninspired. But at least Bradley showed he’s willing to experiment. He gave debuts to two youngsters (and, remember, this was only Jones’ 2nd match), tried to reincorporate a few old hands (Pearce and Johnson) and even utilized a formation that has been en vogue in England (Chelsea, Arsenal, and Manchester City have all used three defensive midfielders in recent matches). Taken in conjunction with the Poland match, Bradley’s experimentation should be seen as a sign that he is ready to move beyond using a 4-4-2 regardless of the opponent. With a bit more seasoning, the gringos could be on their way to a tactical renaissance. Let’s just hope it doesn’t lead to a succession of goose eggs on the scoreboard. It sure was boring. Jones looked good again and Lichaj might be the answer behind Cherundolo. Out of curiosity – why refer to it as a 4-1-4-1 and not a 4-5-1? 4-5-1 is really a type of general description of a series of formations. 4-1-4-1 is a bit more precise.